P.T. Barnum was Vinnie's great friend, and greater promoter. Known today mainly for the circus that still bears his name, Phineas Taylor Barnum was so much more than that during his lifetime. He was born in Bethel, Connecticut, in 1810 to a store keeper and his wife. Soon showing a talent for selling people things they had no idea they even wanted in the first place, Barnum was himself a shop keeper, real estate speculator, lottery runner and newspaper publisher, all before the age of twenty-five. In 1835, he began his great career as a showman by purchasing the contract of an 80-year-old former slave named Joice Heth. He quickly decided to advertise her as the former nurse to George Washington, a woman over 160 years of age—and the gullible public bought it. While he never said "There's a sucker born every minute," Barnum did exhibit a genius for understanding that the public wanted to be entertained, not lectured—a novel notion in an America still steeped in its puritanical origins, in the years prior to the Civil War. In 1843 he heard of a diminutive young boy, only twenty-five inches high, in the town of Bridgeport, Connecticut. 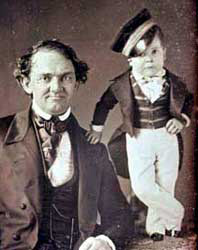 Barnum visited the 5-year-old Charles Stratton and convinced the boy's parents to hand the child over to his care. He then groomed him, taught him to sing, dance, act like a gentleman (even to take wine at dinner and smoke cigars), added a few years to his age, and began to exhibit the child as "12-year-old" General Tom Thumb. He took Stratton overseas to make his reputation; there he was feted by Queens and Kings—particularly the young Queen Victoria and her family—so that when he returned to the United States, he could truly be trumpeted as one of the first international celebrities. Stratton was still at the top of his fame in 1863, when he met, and quickly married, the equally diminutive Lavinia Warren, Barnum's newest discovery. Barnum went on to bring Jenny Lind, the great opera singer, to America, where she became the "Swedish Nightingale." He also bought a rundown museum in New York, transforming it into Barnum's American Museum—truly the first respectable entertainment palace in the United States, the Disney World of its time; a place where genteel ladies and farmers with their families and foreign visitors could all spend a happy few hours being entertained by Barnum's many "curiosities," entertainments, and exhibits. Among the many delights on exhibit were: Wax works, a live Beluga whale in what was America's first aquarium, Grizzly Adams's trained bears, a flea circus, dioramas, Chang and Eng, the Siamese Twins, the trunk of a tree beneath which Jesus' disciples sat, the famous Feejee mermaid (actually the torso of a dead monkey sewn to the tail of a fish), and of course—General and Mrs. Tom Thumb. Barnum made and lost several fortunes over the years, and never apologized for deceiving the public in the making of some of them, insisting always he was giving them what they really wanted to see. (His first autobiography, published in 1855, freely admitted to the Joice Heth hoax.) Many of his "curiosities" became his good friends; General Tom Thumb came out of an early retirement, in the 1850's, to tour again in order to help Barnum come out of bankruptcy. After the American Museum burned down a second time, Barnum turned to the circus, in 1871. In typical Barnum fashion, he took a struggling industry and reinvented it, partnering with several smaller, struggling circuses and eventually joining them together into one "Greatest Show on Earth," the Barnum & Bailey's Circus. His was the first circus to travel by train. 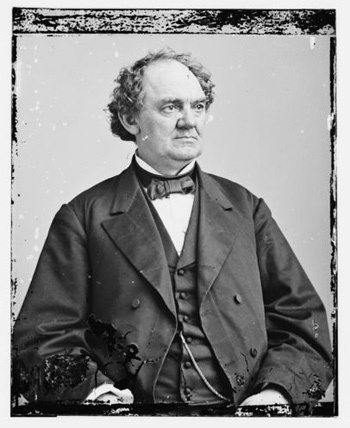 Barnum dabbled in politics, was an ardent abolitionist, married twice, lived in palaces, traveled the world, wrote one of the most famous books on advertising, "The Art of Money-Getting," which is just as relevant today as it was in 1880. When he was dying, in 1891, he gave a newspaper permission to print his obituary so that he might read it. He died a few days after it ran; his last words were, "How were the receipts today at Madison Square Garden?" His circus was performing there at the time. Two wonderful websites depict P.T. Barnum and his world: The first is the website for the Barnum Museum in Bridgeport, CT. The museum is currently undergoing an emergency restoration, as it was damaged in a tornado in the summer of 2010—ironically, the centennial of Barnum's birth. Donations to help restore the exhibits—consisting of valuable memorabilia from the circus and Barnum's most famous exhibits, including the Strattons—are welcome. And finally, there is an interactive website that depicts the wonders of the American Museum, in its heyday—The Lost Museum.